The following table lists the plugins which are in Development. The purchased versions of the plugins add sample accurate sync to the demo downloads. What this basically means is that the timing of the demo versions is limited by the block size of your DAW package (512 samples in Logic 4.0, for example - around 10ms per block at 44.1Khz). With the demo version, notes will be quantised to the nearest block start, meaning that notes will move around 5ms in time on average. The purchased versions overcome this limitation, and will trigger notes at exactly the sample you specify. Note: The demo of FMHeaven is only available with feature limitations. For further information about the limitations, refer to the online documentation. To check compatibility with your DAW, please download and try the demo version first. An FMHeaven demo for OSX has been released. In addition the PC demo has been updated to version 1.5, showing off the features of the latest version. Well, finally, after a couple of years, an FMHeaven update has happened! Existing registered users should have by now received a free update. The new version of FMHeaven includes a pair of multimode filters. Each filter has a separate cutoff envelope, and each of the 6 oscillators can be output directly to the output bus, or through the filters. This allows the filters to be used on some oscillators, but not on others, offering some interesting options. The default sound bank now includes new sounds by Summa which take advantage of the filters to great effect. 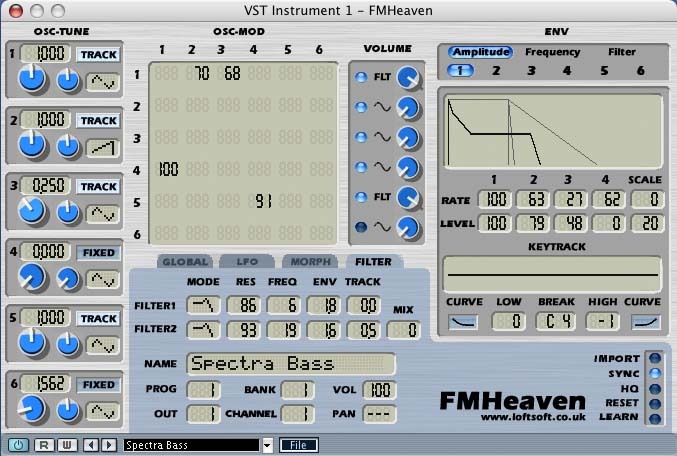 The latest release of FMHeaven is available for PC VSTi and OSX VSTi. An OSX AU will be available shortly. The FMHeaven demos for PC and Mac have been updated to the latest version. In addition, the online documentation has been updated to include the new features. An advanced oscillator design which includes eight additional waveforms, bringing the total to 16. In addition waveforms can be inverted, and set to 0Hz for waveshaping duties. Support for mono/poly operation, including a portamento effect in both modes. Individual frequency envelopes for each oscillator. These are idea for drum and brass sound attack transients, and also for anyone wanting to create 70s style Sci-Fi sound effects! A powerful voice morphing facility which allows most synth parameters to be modified for playing voices using the mod wheel and aftertouch control. The demo and online manual will be updated to reflect the new facilities shortly. On another note, FMHeaven is in the process of being updated to version 1.4. This release includes support for monophonic voice allocation, and variable portamento which works in both mono and poly modes. In addition the synth gains frequency envelopes for each oscillator, and an interesting morph facility which allows mod wheel and aftertouch to modify just about every synth parameter whilst voices are sounding. The release is in alpha testing at the moment, so expect the full release sometime in Feb. Version 1.3 of FMHeaven has been updated to fix some known problems with Cubase, and to implement the High Quality voice mode. The High Quality mode improves the sound quality of the output from the synth, but at the cost of some additional CPU overhead. In addition version 1.3.7 fixes some DX7 import problems. Version 1.3 of FMHeaven is finally with us. This release includes a completely revised GUI and an improved feature set - the key addition being support for TX81z sound banks. This release is free for registered users. Eight complex oscillator waveforms available on each oscillator. The waveforms are from the TX81z, and the FMHeaven import feature will support importing TX81z sounds. Support for exponential and linear keyboard scaling bringing more accurate import of DX7 and TX81z sounds. Ability to copy envelope settings across oscillators - this saves alot of effort when building new sounds. A redesigned GUI - there is much room for improvement on the GUI, and with any luck most concerns with the existing one will be addressed with this release. I will be looking for beta testers for this version of the synth soon. Better mapping of DX-7 sounds to FMHeaven. This is particularly noticeable with slow attack voices such as string sounds. These are now much more useable when running with FMHeaven. Support for keyboard rate scaling - this varies the envelope rates across the keyboard, allowing higher notes to have faster attacks, for example. Unison mode. This allows multiple voices to be triggered per note, with control over detuning between the voices and separation creating stereo effects. Oscillator sync control. Allows oscillators to run free, giving slight tonal variation between successive notes. Had lots of feedback on release 1.0, and many people have identified an embarrassing bug which caused the synth to fail under Windows 98. This has been fixed in the update, so you should now be able to get the demo to work. Support for additional DX7 file formats.